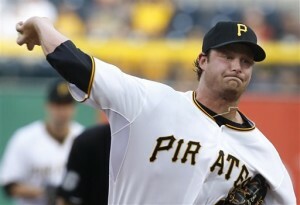 The first-overall pick in the 2011 MLB Amateur Draft by the Pittsburgh Pirates, Gerrit Cole, dazzled in his major league debut on Tuesday night, living up to the hype that has followed the top pitching prospect throughout his career at UCLA and the Pirates minor league system. After receiving his big league call-up from Triple-A Indianapolis earlier in the day, Cole joined the club in Pittsburgh for his debut against the San Francisco Giants, a debut that would result in his first career victory. Cole went 6 1/3 strong innings, surrendering two runs on seven hits while striking out two batters and walking none, en route to an 8-2 victory for the second-place club in the NL Central standings. Cole started off the game with a three pitch strikeout of Giants center fielder Gregor Blanco, each pitch being a 96 MPH fastball. Cole found himself in a bases loaded jam in the second inning, but was able to successfully work his way out of the inning and would set out on a stretch in which he retired 13 straight batters. The Pirates’ phenom was dealing after six innings, holding onto a 5-0 lead; however, Cole would surrender a pair of runs in the seventh before his exit with one out in the top of the frame. Not only did Cole pitch a strong game in his big league debut, but he also contributed offensive run support of his own in the second inning. In his first major league at-bat, Cole ripped a single to center, scoring both Russell Martin and Pedro Alvarez and opening up a scoreless game 2-0. To say that Cole met expectations Tuesday night is an understatement, as one of the top pitching prospects in baseball pitched a great game that showcased a plus fastball and command, all of the skills that have many projecting him to become the ace of the future for the Pirates and one of the premier starters in the game.